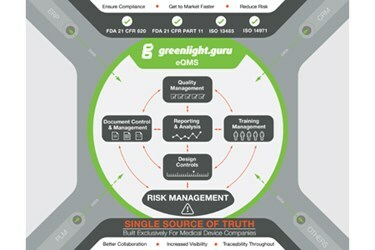 greenlight.guru recently announced the public release of its cloud-based quality management software exclusively for the medical device community. greenlight.guru allows medical device manufactures to bring new products to market faster while reducing risk by providing an integrated quality system that is easy to use and designed for regulatory compliance. greenlight.guru released its alpha version to a small group of early adopters in March 2014 with the goal of gathering valuable user insight. On November 3, its beta version was released privately and has been well received by emerging and mid-stage medical device companies — which according to industry statistics represent more than 80% of U.S. medical device companies — under an annual SaaS subscription model. greenlight.guru produces beautifully simple software solutions exclusively for medical device companies to allow them to bring higher quality products to market faster, while reducing risk and simplifying regulatory compliance. greenlight.guru’s quality management software provides device makers a single source of truth by integrating the management of design controls, controlled documents, quality processes and more in one, easy to use platform. To learn more about how greenlight.guru’s quality management solution can help your team get its product to market faster, visit www.greenlight.guru or call 317-762-5311 to schedule your free personal demo today.